Whatever my thoughts about the Zags, you have to be impressed with their program. When was the last time a WCC or WCAC team was No. 1: was it USF in the late severties; these Zags are better than those Cartwright lead teams, imo. The Pilots goal of being competitive in this league is daunting and seemingly becoming more so. Um, the zags were ranked #1 during the 2012-2013 season and ended with a 1 seed. Karnowski’s first year. They got their ranking in March after a 16-0 conference season. They lost to Wichita State in the third round. wrv wrote: The Pilots goal of being competitive in this league is daunting and seemingly becoming more so. Agreed. Obviously GU is many levels above the rest of the WCC--let alone the bottom half of the conference. All of the other schools in the WCC have the same goals we do--to improve. This is already paying dividends with wins at USD, LMU and USF... SMC and BYU may be down (relatively) a bit this year but are still the cream of the conference. Pepp has had very strong recruiting in Coach Romar's short tenure. Pacific had success/wins last season (TBD this season)... SCU just announced $25MM in donations for a new Athletics Academic, Training & Practice Center. USF also has new/renovated facilities. The hill to climb is indeed very steep, just to keep up with the conference, let alone climb the ranks... there have been great UP Athletics capital projects completed recently, or soon to be completed: The Beauchamp Center (practice facility), Chiles renovations (training & medical facilities, fan atmosphere improvements), The Franz Campus (new tennis center, track complex, rowing, beach volleyball, soccer/lacrosse practice fields), and the in-process complete renovation of the Baseball stadium. I hope that when we are making these investments, we are making sure that we end up with "best in conference" facilities. I also hope that with the completion of The Beauchamp Center and the funding of the Franz Campus, some focus can shift back to the Basketball programs to make sure we are investing appropriately to not only keep up, but exceed our conference mates. I think we have to spend about 8 times what we currently do to match Gonzaga. Geezaldinho wrote: I think we have to spend about 8 times what we currently do to match Gonzaga. Interesting you bring up spending on the day this very interesting piece by John Canzano in the Oregonian today popped up on my Twitter feed - https://www.oregonlive.com/sports/oregonian/john_canzano/index.ssf/2018/11/pac-12-larry-scott-leftout-part1.html#incart_river_index - not directly related to the WCC, but a pretty scathing reminder that not all goals can be accomplished purely by throwing money at it. 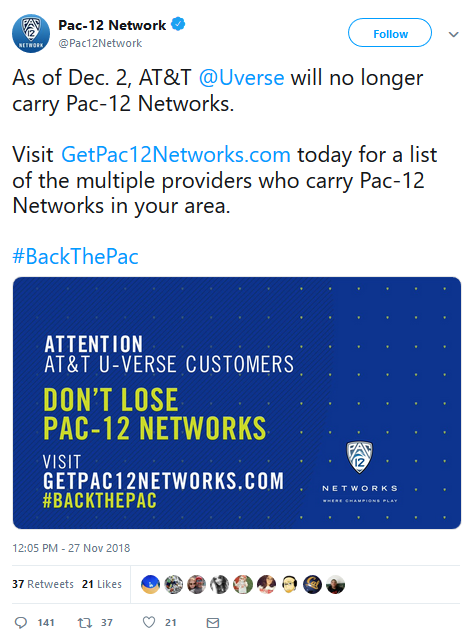 And as I was trying to figure out a way to watch tomorrow's UP/Colorado game, I saw that the Pac-12 Networks feed tweeted this within an hour of the Canzano piece coming out. Ouch. I agree that throwing money in and of itself is not the solution--however the program needs to be a priority for capital investments, salaries, budgets, etc... but also from a more general support/priority standpoint if we are going to keep up with the Joneses. A few examples come to mind to me--and I am not saying these aren't happening--but these are some things to consider: Are the various Offices in Waldschmidt Hall providing the academic support and flexibility necessary to attract and retain the highest levels of student athletes? (I am sure that Notre Dame excels at doing this for football... are we doing everything we can?) Are Athletics a consideration/priority for the Alumni office? Where does Athletics fit into larger University Marketing considerations? As we've found out before, the Pac-12 Network is broken into regions: Arizona, Bay Area, Los Angeles, Mountain, Oregon, and Washington....and not all provide the same programing at the same time. It was met with some excitement when the WCC announced the Pilots vs. Colorado game would be broadcast live on the Pac-12 Network, but that excitement was tempered when it was learned the only TV live feed of the game would be on the Pac-12 Mountain Network. If you want to watch the game on TV in the Portland area, you'll have to wait for the repeat/delayed broadcast that airs at midnight on Wednesday 11/28. And if we don’t have Xfinity credentials, or any other “approved” provider? Seems like the Pac-12 pays a metric boatload of cash for a network not a lot of people can watch! But hey they get a bunch of late-night kickoffs in Corvallis, Eugene and Pullman! Looks like I get the game via Comcast's streaming of the PACMT network. wrv wrote: When was the last time a WCC or WCAC team was No. 1: was it USF in the late severties; these Zags are better than those Cartwright lead teams, imo. And it marks the second WCC #1 ranking of the 2018-19 sports year (and 6th top 5 ranking)... BYU has been ranked #1 in volleyball most of this season; BYU and Portland were ranked #2/#3 in men's XC; Santa Clara got up to #4 in women's soccer; and SMC got up to #5 in the men's soccer. Not a bad fall for the WCC. Dean Murdoch wrote: And if we don’t have Xfinity credentials, or any other “approved” provider? Tonight around the WCC, everybody lost. Sound Voltex wrote: Tonight around the WCC, everybody lost. The only real upset was UCI over SMC, the Gaels were favored by 7 over the Anteaters. Fresno St. is a very good team and was favored by 10 at home, so UOP payed very well in taking the Bulldogs to overtime. USF beat Stephen F. Austin in Belfast this morning and will now play Buffalo. Dean Murdoch wrote: USF beat Stephen F. Austin in Belfast this morning and will now play Buffalo. It was a fun, race-horse, game to watch from Belfast, Northern Ireland, but USF (NET #12) lost to #21 (NET #14) Buffalo, 85-81. Let there be no mistake about it, the Dons are good, but this morning they only shot 4/20 from 3-point range, and really could have used my man Souley Boum, now redshirting at UTEP. USF's coach Kyle Smith has done wonders to turn the program around in just his third season on the Hilltop through smart recruiting and player development. USF is mature and deep, and Smith was able to juggle his lineup in adjustment to Buffalo's intense pressure and larger size underneath. It's always tougher when WCC play begins because the teams are scouted so well, but USF will finish no lower than 4th in the conference, and could even be second! GU beat Creighton in the Zags first road game of the year, 103-92, but it wasn't easy. The Blue Jays controlled the first 30 minutes, but Zack Norvell scored 23 of his career high 28 points in the second half, and GU came from 12 points down to win for the 8th time this year. SMC is back in a big way after 4 straight losses thanks to 13 3-pointers against Cal yesterday. Former UP recruit, Malik Fitts, is now a monster after his transfer from South Florida and a redshirt year, and based upon his performance last night, he'll soon be an all-WCC choice. USD, UOP, SCU, and PU also won yesterday, but despite Childs 31 points, BYU lost to instate rival, Weber State, 113-103. LMU risks its unbeaten record tonight at #53 UCLA on the Pac-12 Network. Back to rock bottom on the Mid-Major Madness WCC Power Rankings. Honestly, I have nothing to say. This team is really bad. And then there is us--the results speak for themselves. I still feel like I don't have a good gauge on this team, other than us not yet having a quality win. We played well against North Texas (but we still don't know their level, looking at their results), and ended up getting blown out @Hawaii & @Colorado (and vs. Texas St). The wins @CSUN and vs. USC Upstate & Cal Poly are not looking strong. Without Clark & Tryon, our bench has not been as long as I hoped it might be. Akwuba may be better than anticipated. Shaver and Walker continue to be solid. The rest of the non-conference schedule is reasonable... with a few tougher games (@PSU, Seattle U) and some good opportunities to pick up wins (Sac St, Grambling St, FAMU, CSUF). Maybe by New Year's Day, I will have better grasp on this... Beating the Viks on Wednesday would be a good step. Coach Krzyzewski wrote: The single most important ingredient after you get the talent is internal leadership. It's not the coaches as much as one single person or people on the team who set higher standards than that team would normally set for itself. Sitting courtside, it is pretty obvious to me that no natural team leader has emerged. Lots of direction coming from the bench, but until Crisshawn finally gets on the court, there is very little internal leadership. I guess I am troubled by the team not playing a consistent team game. I see too many hero shots; great if you make it, but really bad when you miss. Is that the plan from the coaches, or is it selfish decisions by the players?